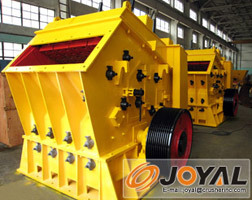 The materials are crushed via impact energy produced in the impact crusher. When the materials enter the zone of the board hammer, they are flung into the impact equipments via the high-speed impact of the board hammer. These materials will be re-crushed after rebounding into the scale board. The large materials are crushed into small pieces until they become the specified granularities. The end products come out from the base of the impact crusher. 5. Solid construction, high efficiency.